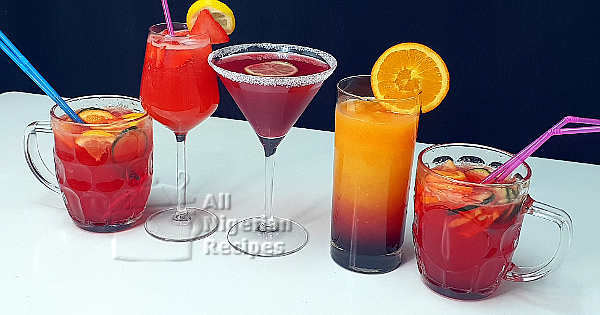 Zobo (Hibiscus) Sunrise Cocktail will give you such a lovely feeling, you will not want to stop drinking! It is made with organic hibiscus petals with lots of health benefits and fruit juices. 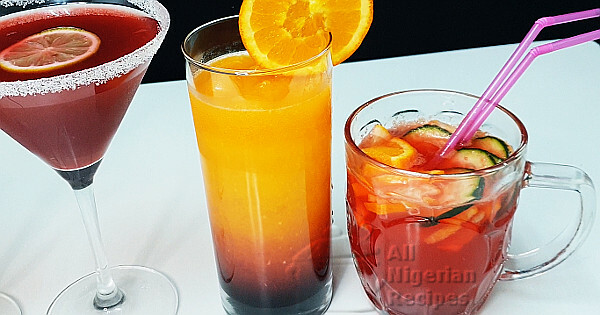 First, make the zobo syrup. Rinse the zobo petals very well. Then boil them in a pot with the half cup of water and sugar till you get a solid deep red colour and the sugar has completely dissolved. See video below. Sieve to separate the zobo syrup from the petals. Set the syrup aside. Add ice to a glass cup. Add the orange juice and grape juice. To make it alcoholic, add tequila (to your liking) at this point. Stir then pour the zobo syrup from one point. You will see it go to the bottom of the glass and mostly stay there. Some of it will rise to blend with the orange juice hence the sunrise in the name.